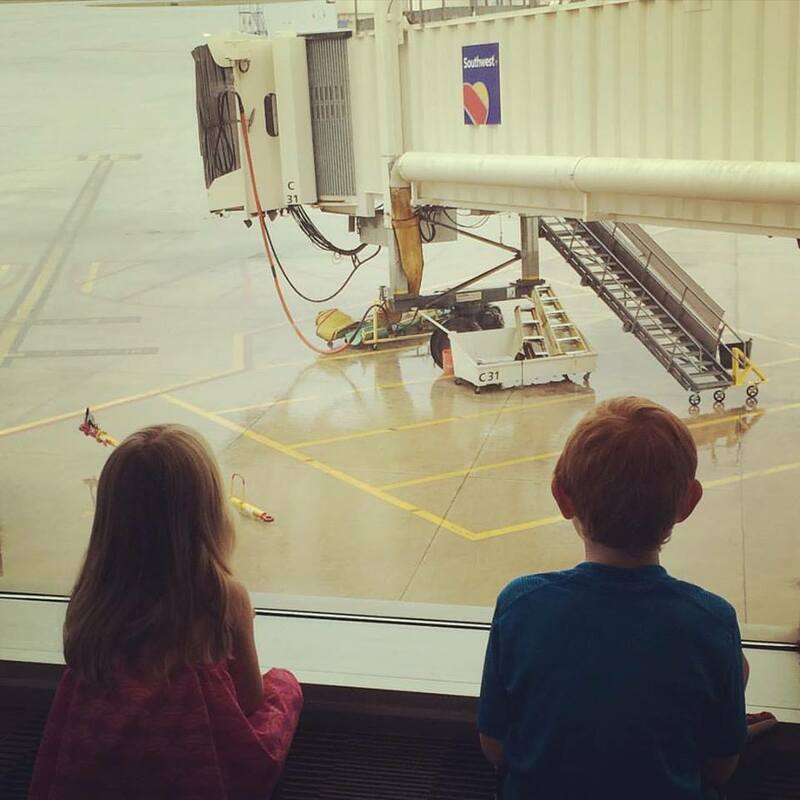 Have you ever tried to navigate a busy airport with two little kids? After getting everyone dressed and kissing mom goodbye, we piled into the car and set- out for the airport. I listened to a podcast of one of my favorite preachers, and the kids watched Teen Titians Go on the small screens mounted to the seatbacks in front of them. After about an hour (or “Three Teen Titians episodes” in kid talk) we arrived at the airport. The elevators from the parking garage to the ticketing counter opened to a zoo! I should have known better! Isaac was so enthralled by everything swirling around him that he kept stepping out in front in attempts to pull the chain toward things he wanted to investigate. I tried to turn us to the left, but Isaac pulled straight ahead . . .
“But I want to ride that” (pointing to the escalator). As huge spaces with bright decorations opened in front of us, masses of people were moving in sync toward the ticketing counter. After one glimpse, I thought, “We will never make it through that line and get to the gate in time.” I learned a long time ago that you can skip the inside line and get an unaccompanied mirror pass at the curbside check-in. As I started walking toward the sliding glass doors that led outside, Isaac started pulling us in the direction of the crowd where the long line was forming. As we stepped outside, the hustle and bustle became more chaotic as everyone crowded together on a narrow sidewalk. Once again, Isaac began to step out front in attempts to lead the way. After saying repeatedly, “Isaac, you can’t lead right now, you have to follow me,” I finally pulled him aside, got down on one knee, and explained. Once Isaac stopped trying to lead, we were able to get a pass, ride the escalator (a first for the kids), speed airside on the monorail, clear security, and walk to the gate before Jackson arrived. When he disembarked, the kids ran over to hug him and were filled with joy. Big brother is here! Mission accomplished. Imagine how things would have been different if I had allowed Isaac to lead? There is no telling where we would have ended-up! All of this got me thinking about how often we step out in front of God and insist on leading our own lives. Shiny, exciting, and enticing things swirl around us, and we compulsively move in the direction of whatever happens to capture our attention. Often, we have no idea where we are going or what moving in that direction might do to us. Crowds of people surge in a particular direction and we get caught-up in the stream. How often does God say, “You can’t lead right now, you have to follow me.” How often do we ignore this voice? How many of us have become deaf to this voice? The truth is, God knows where he’s going and what steps have to be taken to get there, and if we want to go where God is going then we have to follow. We have to resist the compulsion to step-out in front, to take charge, and to blaze our own trail. If we fail to do this, then there is no telling where we will end-up. In my own personal experience, it is usually not a very good place. We have to resist the compulsion to pursue everything that elicits our desire. We have to learn to stop, listen, discern, reflect, and follow. One day Isaac will be a great leader. It’s in his DNA. But for now he has to listen, watch, and follow until he learns the ropes and knows where he is going. This applies to all of us. God intends to make us leaders, but before we can lead others we have to learn to be led.